Electronics control toady’s vehicles. Modern cars and commercial vehicles have numerous sensors which provide Information to the vehicles control unit and that in turn affects way it performs or its fuel efficiency. It’s not simply a case of reading a code and replacing a part. Fault codes can be triggered on one item as a result of a fault in another. Our technicians have the knowledge and experience - and we have Invested thousands of pounds on the latest diagnostic equipment to enable us to investigate the fault and advise our customers on the best options for repair. Dashboard warning light come on? 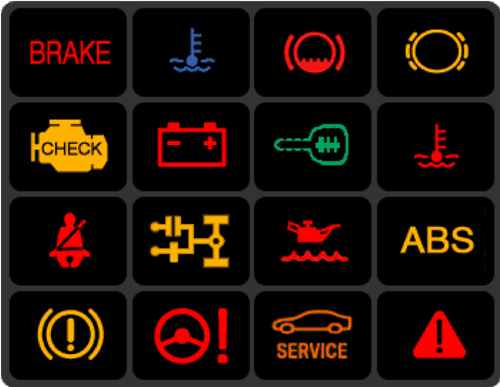 Not all warning lights will require diagnosis work, some simply warn you that something simply requires attention – like the engine oil or screen wash needs topping up – but others can indicate a fault with the vehicle and that where 1st 4 can help. Diagnostic equipment is expensive to buy and maintain – but accurate diagnosis depends on both that investment and equally the knowledge of the technician using it. We have the technology once only available at the vehicle main dealers and can provide you with accurate information at competitive prices.